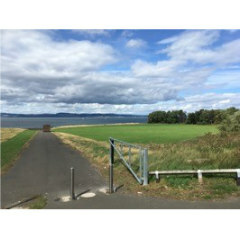 This stretch of grassy fields (Gypsy Brae) was the location of Granton Sea Quarry. The earliest recorded use of stone from this quarry is for Holyrood Palace (1532) and Leith Bulwark (1552-53). 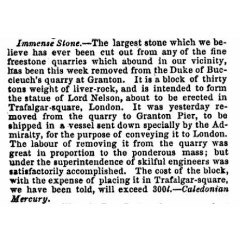 Later, the stone was used for Granton Harbour’s pier and breakwater, the Granton Hotel, and even the statue on top of Nelson’s Column in Trafalgar Square, London. The quarry, nearly 80 feet deep and over eight acres, collapsed and flooded after a storm in 1855. 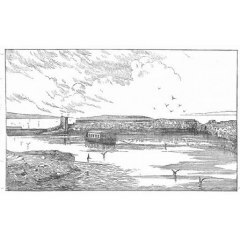 In 1884, it became the headquarters for the Scottish Marine Station for Scientific Research. This organisation carried out research on marine life in the quarry both from a floating platform and nearby buildings. The inconspicuous rock beds along the Forth shoreline are known as the Muirhouse ‘shrimp-bed’, in which geologists made a major discovery: a complete conodont, an eel-like creature whose teeth are the earliest found in the fossil record. The first trace fossils of the body of a conodont was unknowingly collected in the quarry in the 1920s. Starting in the 1980s, 11 more near-complete conodonts were found and identified, and then more again in 2013.